Le Clos des Terres Soudées is a luxury, family-owned Guest House; situated in the heart of the vineyards of Vrigny which allows for a quiet and relaxing break. The Guest House is located on site at a Premier Cru Champagne-making estate, and tours of the cellars can be arranged in advance, as well as the opportunity to see first-hand the Champagne-making activities according to the season. Located 20 minutes from Reims city centre, the guest house is rurally situated making for a relaxing as well as picturesque stay. Champagne-Ardenne TGV Station is also located 6km away. Despite its rural location, one still has the option to visit many of the historic delights within Reims, for example the Cathedral, classified by UNESCO as a World Heritage site. There is no restaurant within walking distance therefore we strongly recommend having access to your own vehicle. There is a pretty garden on site from which exceptional views across the vineyards can be admired as well as two lounges, ranging from the Napoleon III lounge, which offers a relaxing atmosphere in which one can enjoy a pleasant glass of Champagne, to the more design-style lounge on the ground floor, with a glimpse of the staircase leading down to the wine cellars. Champagne can be purchased at the estate and enjoyed in the Guest House facilities or in your room. For guests with a car, there is a private enclosed car park on site. 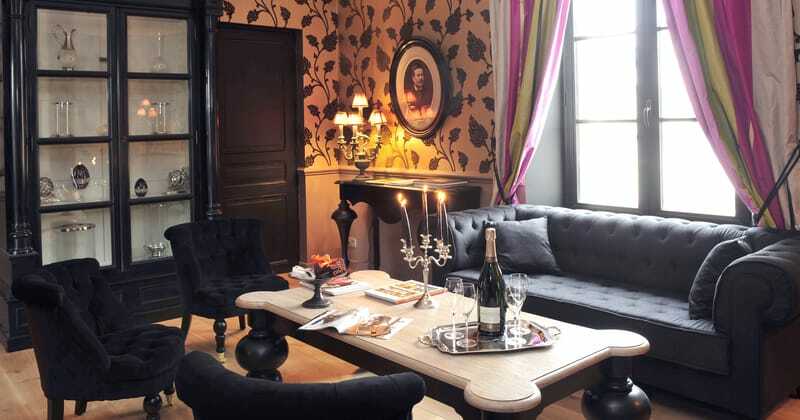 This boutique hotel has just five rooms. Each room narrates the process of Champagne-making and is furnished to further enhance the passion of working within the vineyards. The rooms represent modernity as well as comfort and are equipped with a flat-screen TV and an en-suite bathroom with a bath or shower and a hairdryer. The larger Suite can accommodate up to four guests.